Pioneers in the industry, we offer fluke 1732 and 1734 three-phase electrical energy loggers from India. We are a reckoned name engaged in offering highly reliableFluke 1732 and 1734 Three-Phase Electrical Energy Loggers Our trained professionals are backed with rich expertise to analyze harmonics, flicker, Transients frequency variation, and voltage variations (sag & swell). Owing to our assiduous workforce we are assisting our prestigious clients in assessing performance for wide range of process equipments. Further, we are offering credible services to evaluate the performance at a competitive price. 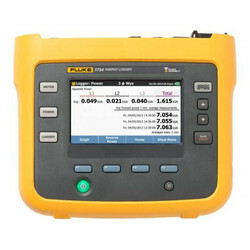 Looking for Power Quality Analyzer ?